I don't know if you can quite get the feel of Flemingsburg from this picture, but this neocolonial courthouse sits at the very top of a hill in a very hilly little town. 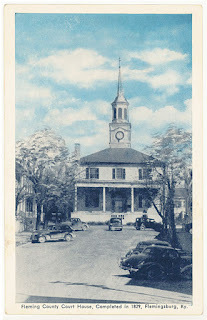 This is the county's third courthouse, and it was built on this site in 1952. This building replaced a courthouse built in 1830 (pictured, right), which was considered among the finest examples of Federal architecture. Apparently, the old building contained a good deal of intricate interior and exterior wood carvings which had been done by trained slave labor. The old building was demolished not due to poor condition, but because a donor had bequeathed money for the construction of a new courthouse. According to Carpenter's Courthouse book, the building "unsuccessfully tries to emulate the style and details of the former building, including a modern fan doorway." The Flemingsburg Historic District file in the National Register reads that this courthouse is a "nondescript public structure replaced the circa 1830 federal square-plan courthouse that was built by Eckles and Stockwell. 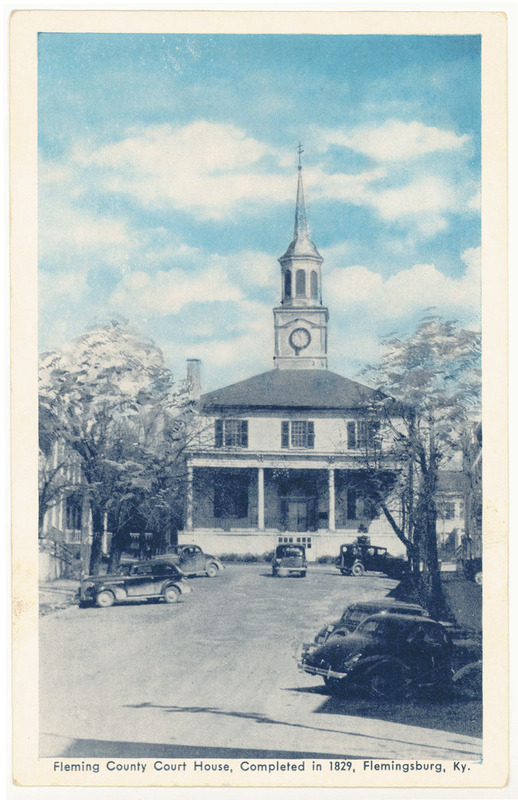 The earlier square-plan courthouse not only represented one of the earliest courthouse designs to be used in Kentucky, but also stood as a monument to the strong building traditions of the Fleming County community." Fleming County has had a few really interesting residents over the years, including a famous Union spy (James J. Andrews) and one of the men who raised the flag over Iwo Jima (Franklin R. Sousley). [ed. note] In 2009, ground was broken on the new Fleming County Judicial Center. A number of historic structures were demolished to make way for this new 32,800 square foot judicial center. The dedication is scheduled for later this month, February 21, 2012 at 2:00 p.m.